Kobelco Construction Machinery attending the World Demolition Summit as a Bronze Sponsor - Kobelco Construction Machinery Europe B.V.
Kobelco Construction Machinery Europe is pleased to announce its presence at the upcoming World Demolition Summit. The event will take place on 2nd November 2017 at Millennium Gloucester Hotel in London, UK. KCME is a Bronze Partner of the event and will be promoting two demolition machines: SK400D-LC and SK550D-LC. Kobelco demolition machines with the exclusive NEXT joint systems are designed for quick assembly and ease of transport. The machines can be quickly set up and adapted to meet the job requirement and to be used for the full duration of the job. Due to the unique structure of the attachment, transportation is completely safe and with just a few steps. Kobelco demolition machines have also enhanced safety functions like cab interference prevention system, stability warning system, tilting cab and system of cameras among many others. Additionally, fuel costs can be reduced with outstanding fuel consumption and mode selection. Kobelco designed a system that allows a quick and safe assembly. Each boom attachment has a block structure that simplifies assembly/disassembly and transport. The piping can be connected at ground level, and the steps for attachment assembly/disassembly from pressure release to pin fixing can be completed safely in a short time. We invite all attendees of the World Demolition Summit to visit us at our stand for more information on the Kobelco’s range of demolition machines. 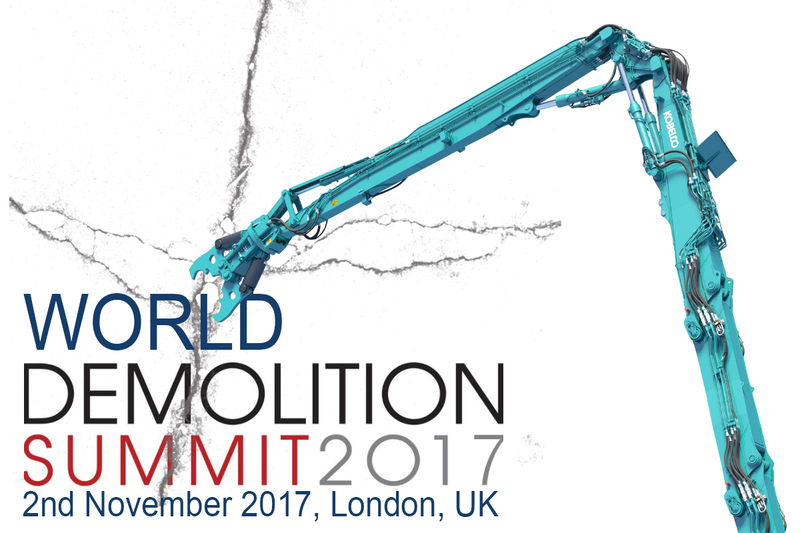 World Demolition Summit is the major international event celebrating excellence and innovation within the demolition industry. Co-organized with European Demolition Association, the event consist of conference, gala dinner and awards. A high-level technical conference will feature presentations covering some of the most challenging demolition projects carried out around the world in recent months.